I’ve never been able to decide if this is more or less fair than Blood Moon. With Blood Moon, you can theoretically use your fancy non-basic lands for red mana, but that feels terrible when your deck isn’t part red. With Back to Basics, you theoretically can use your fancy non-basic lands once, but that doesn’t really pan out when they wait until you’ve just cast a spell or two and throw it onto the table. Perhaps it works out to about the same. If you’re looking to build a deck for a card like Back to Basics, it’s obviously much less symmetrical than it looks, at the cost of possibly having to forgo a lot of the interesting multicolored cards and utility lands. In formats like Legacy, there is a place for that kind of deck, and thus for cards like Back to Basics. A blue analog to Blood Moon? Man, blue got all of the cool toys back in the day. Back to Basics is, indeed, the blue version of Blood Moon, meant to hose decks with greedy mana bases and give blue mages another way they can accomplish Nothing. Given that it keeps the lands from untapping, you still choke most decks out of their colors and out of ever doing anything, if you have the suite of countermagic to back it up. 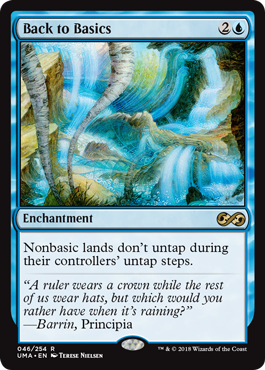 Think of it as a different sort of lock-out piece that blanks against different decks and is stronger against others (and doesn’t do great if a deck can manually untap its lands)…but the strength is that it’s a lock card blue can use without having to dip its toes into other colors. Given that Back to Basics was a card with no reprintings and a price tag around $100, a reprint is very welcome, even if it enables more blue players in Legacy to do as little as they can get away with. While the downside is symmetrical, remember that symmetrical hoser cards like this one are ones you can break symmetry on.